In Cornerstone of Recovery’s Women’s Program, female clients find an approach to addiction treatment unlike any other. 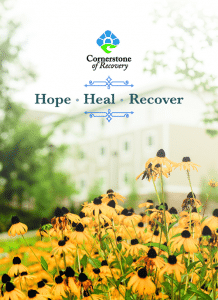 In many ways, it’s a drug rehab program that follows a successful formula used by Cornerstone since the doors first opened in 1989: clinical and traditional methods that treat patients using a BioPsychoSocial-Spiritual model, addressing the needs of the whole person with a specific path tailored to each individual. You’re a sick person, not a bad person, and the treatment modalities used at Cornerstone are designed to meet your physical, mental, emotional and spiritual needs so that the life you pursue beyond your disease is a fulfilling one in all areas. For years, the patients at Cornerstone of Recovery were combined into coeducational groups that focused on an all-for-one approach to rehabilitation and treatment. But when new facilities were built and programs were moved to a single campus in 2017, the clinical staff at Cornerstone saw an opportunity to create a unique treatment path designed specifically for female patients. Females in Cornerstone’s various rehabilitation models – Young Adult, Recovery Renewal, Professionals, Newcomer – are treated accordingly, but their individual therapies are carried out within the safe space of a women’s only program. Group therapy, individual counseling, activity therapy, acceptance/integration therapy – they’re all designed for both the individual and the gender, because at Cornerstone, we recognize that women face issues in addiction and alcoholism that are unique to them. We realize that it’s difficult, and sometimes impossible, to deal with trauma caused by men if men are a part of the process, and for that reason alone, all of our processing and therapeutic groups are led by female counselors. Most of them are in recovery themselves and know full well the issues that female patients must address to sustain long-term recovery, many of them presenting hand-in-hand with addiction to alcohol and drugs. The Women’s Program is just another way that Cornerstone of Recovery is unlike any other addiction treatment center or drug rehab. We believe that drugs are just a symptom of a problem that’s internal, one that manifests in a number of life traps addressed by our specialized therapeutic tools, including ones that offer healing from anxiety, depression, trauma and self-loathing. But few of the tools in our arsenal are as powerful, cathartic or spiritually medicinal than that of the group itself: a sisterhood of fellow travelers, wounded but on the mend, who lift up and support one another in a way that’s miraculous to witness. What makes the Cornerstone Women’s Program so special? It’s a Friday morning, and the gentle ring of chimes signals the start of the day. For some of the women in this morning gathering, it’s the first day of a new journey, one without the shackles of addiction they’ve worn for so long. Led by two Cornerstone of Recovery staff members who have decades of sobriety between them, the women “check in,” telling their peers what they feel, what they need and what they are. “Strong.” “Thankful.” “Willing.” “Blessed.” Each declaration is met with a unanimous response by the other women assembled around them: “Yes you are!” It’s a powerful refrain, an affirmation absent in the darkness of addiction, a lantern blazing with feminine energy that lights the way to places of grace and healing. After a few moments of silence as they gather their thoughts, the women begin to open up to one another. Some are lost, having come through the doors a few days earlier; some are serene, having basked in the safety net that Cornerstone provides. Others find themselves in awe of what they’re a part of, often for the first time in their lives. It’s a palpable and powerful thing, a tribal communion that offers solace, comfort, hope and unconditional love. It’s hope, manifested as a light out of the darkness, and every female patient at Cornerstone finds it among a sisterhood of fellow recovering addicts who make the Women’s Program such a profoundly moving place to get well. “What am I today?” one woman asks, pausing before answering: “Enough.” There’s a moment of silence as heads lift, eyes meet and hearts open. She is, and you are as well. You have a place here, among the women of Cornerstone – other clients and staff members – who want nothing more than to give to you a life you never thought possible. If drugs and alcohol have laid waste to the one you’re currently living, give us a call. We’re eager to help you discover a new one.